Hey friends! 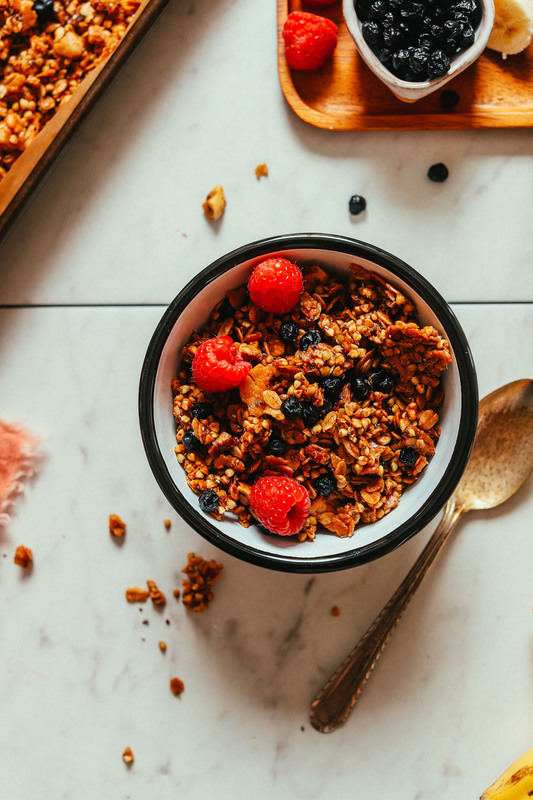 Ready for a bowl of tasty, wholesome, everyday granola? Buckwheat is one of those elusive ingredients that intimidated me when I first learned about it, but the more I cook with it, the fonder of it I become (it’s especially great in our Buckwheat Crepes!). It’s wholesome, gluten-free, and versatile, and it provides a delicious nutty flavor. Plus, it makes extra-crunchy granola, which happens to be my thing. Let’s bake! This granola is simple, requiring just 10 ingredients to make. 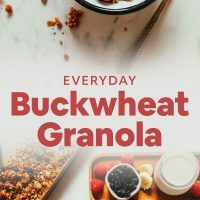 It starts with an even mixture of oats and buckwheat groats, but you can easily use all buckwheat groats if you prefer (I just prefer mixing the two for some texture). Next come nuts and coconut, a little cinnamon for warmth, and coconut sugar and maple syrup for natural sweetness. This granola cooks a little longer at a lower temperature to get an even golden-brown color and super-crunchy texture. This is what we call granola perfection. I wish you could smell it through the screen (swoon). This is the perfect healthier breakfast or snack when you’re craving something a little sweet. Pair with your favorite dairy-free milk (we prefer almond!) and seasonal fruit. Into granola? 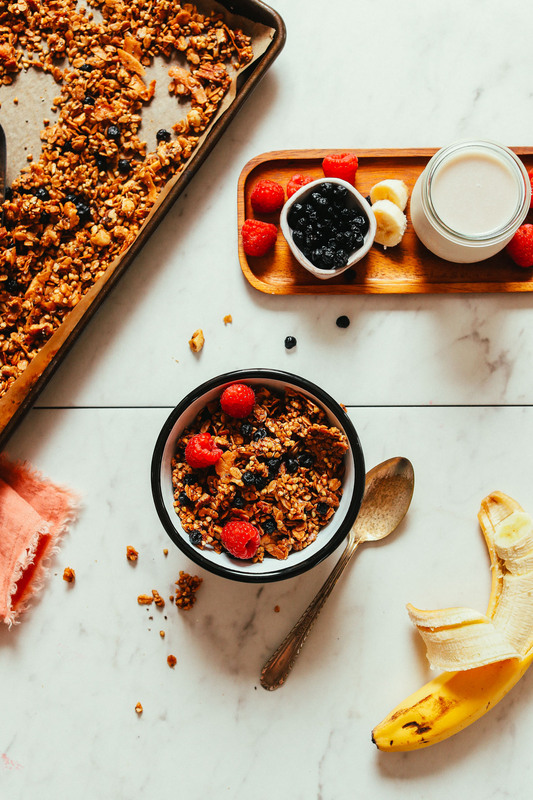 Be sure to check out these 14 Easy Granola recipes! If you try this recipe, let us know! Leave a comment, rate it, and don’t forget to tag a picture #minimalistbaker on Instagram. Happy baking, friends! Easy, wholesome buckwheat granola with oats, coconut, and nuts. Naturally sweetened, crunchy, and just 10 ingredients required! Preheat oven to 325 degrees F (163 C). 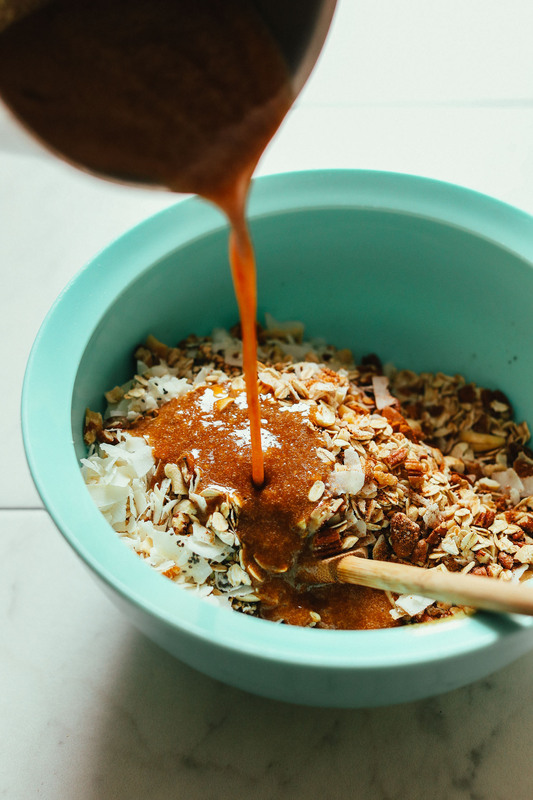 To a mixing bowl, add the buckwheat groats, oats, nuts, coconut, chia seeds, coconut sugar, sea salt, and cinnamon. Stir to combine. In a small saucepan over medium-low heat, warm the oil and maple syrup until melted and combined. Then add the nut butter (optional) and stir again to combine, and pour over the dry ingredients and mix well to coat. Spread the mixture evenly onto a baking sheet (or more baking sheets if making a larger batch) and bake for 25-30 minutes (or until fragrant and deep golden brown), stirring a bit near the halfway point to ensure even baking. Add the dried fruit while the granola is still warm. If adding chocolate, wait until it has cooled completely. Place cooled granola in a sealed container that has an air-tight seal, and it should keep for a few weeks. Or store in the freezer up to 1 month or longer. 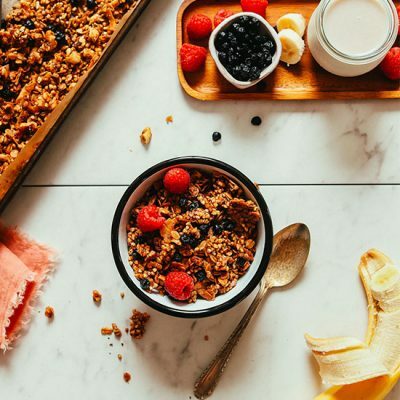 *For an oil-free version adapt from this Aquafaba Granola recipe! *Nutrition information is a rough estimate calculated with pecans for nuts, chia seeds, and coconut oil and without optional or serving ingredients. *Prep time does not include cooling the granola. *Recipe as written makes ~4 3/4 cups granola. Soo yummy. It took me a while to get around to making it. So worth the wait. I love the crunchiness and the flavor. Thank you! 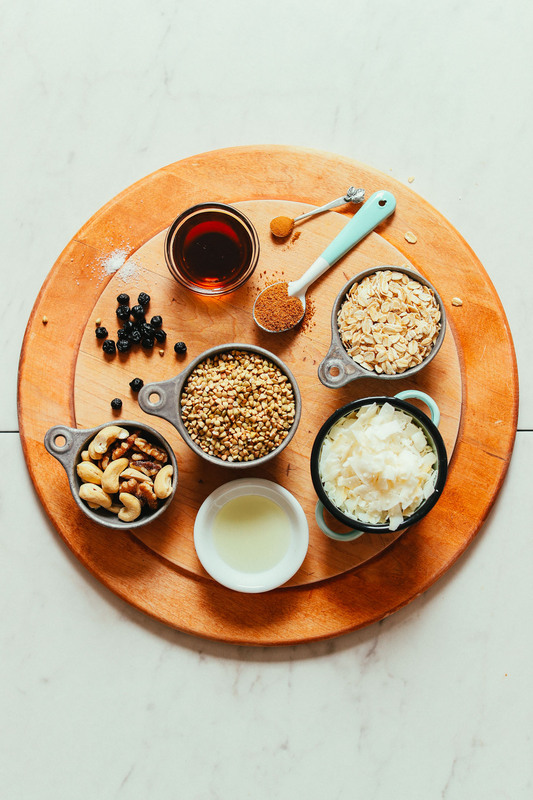 I’ve heard people partially cooking their buckwheat groats on the stovetop before adding to the granola mix, this makes it a bit easier to bite but still crunchy. Do you think that would work with this recipe? Whoop! We’re glad to hear that, Marsha! I love the versatility of this recipe! 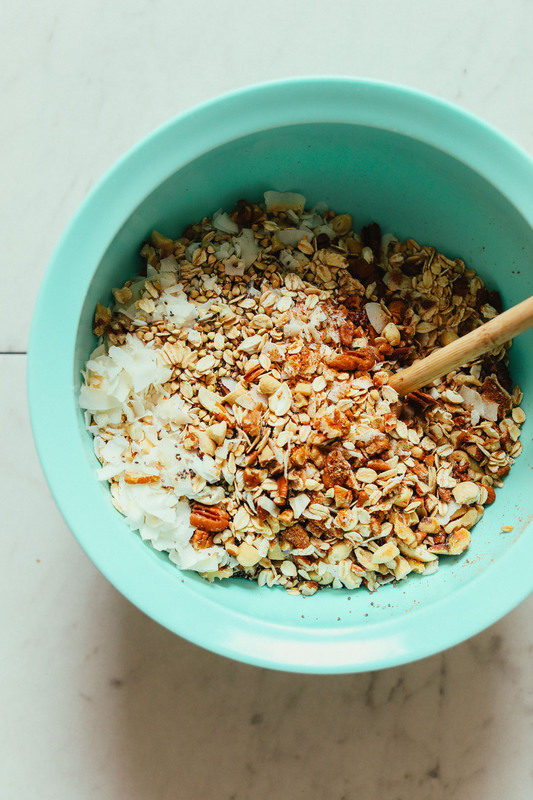 It’s so easy to substitute ingredients to change up the flavors of the granola. This is so tasty and easy that we’ve stopped buying granola. I think so – I live in Germany so they may not be the same as the ones you use. The ones I used are kind of pyramid-shaped, perhaps yours are flat like oats? You could try using pumpkin seeds, sunflower seeds, or raisins in place! Yes… I had all that. Wondering about a binding agent instead of nut or sunflower butter. Any other ideas? Maple syrup or honey if not vegan? I’ve made this recipe 4 times already and I simply love it! I enjoy it on my coconut yogurt or just like that as cereals. It’s also a great cute gift if you put it in a Masson jar. Thank you so much for the recipe! I tested the granola today to give as a gift to our school teachers. OMG, I loved it. Only variations were that I used rice bubbles instead of oats which was awesome. Think it creates less density and I only cooked for 24 mins leaving in the over for 5 with oven off and then out to cool. Thank you ~ definitely will be a regular thing in my house. So delicious! I made this recipe as written and am eating it now! For nuts, I used a mix of pecans and pepitas, for fruit, dried tart cherries, and almond butter, just based on what I had on hand. I might cut the sugar slightly next time for my palette, but it’s also delicious as is. For those commenting about the buckwheat groats, I used Bob’s Red Mill Buckwheat Groats (mostly just because the bulk bin was sold out) and the groats turned out delicious. Crunchy but not hard to chew in any way. Yum. No words but yum. Having never made granola before, I didn’t know what to expect. This was a great first try! I did cut back on the sugar a little and it was plenty sweet. Thanks for another wonderful recipe! Yum is what we like to hear :D Thanks for sharing, Reanna! Hi, I’m just wondering if I could use molasses instead of maple syrup. Thank you for your wonderful recipe. Hi Adrienne! While you can typically replace maple syrup with molasses in a one-to-one ratio, we haven’t tried that with this recipe and can’t say how it would turn out. If you experiment, report back on how it goes! Finally made this after meaning to since it was posted. OMG delicious! I’m so fussy about granola, but this is to die for. I used groats, oats, pepitas, cashews, pecans, chia seeds and coconut. Yay! We’re glad you enjoyed it, Danielle! The flavor was so good! But my buckwheat was really hard. I must have gotten kasha on accident? Can’t wait to try this with some for sure un toasted buckwheat! Delish!!! Crunchy, sweet, earthy, YUM!!! Another Winner!!! The flavour was delicious (I used cashew butter when I made it) but the buckwheat was so hard and crunchy it was like eating a bowl of gravel. I’m thinking maybe I didn’t use the right type of buckwheat? I’m going to try and make it again using oats next time. Sorry to hear that, Sarah! Did you use raw buckwheat groats? I had the same problem! I’m assuming my buckwheat was not raw. Will try again with different buckwheat. I’d never heard of buckwheat groats before so I was on a quest-and what a reward it was! This takes my breakfast parfait to a new level. Whoop! Thanks for sharing, Sharon! I agree with NotVeryPreciseBaker: SO GOOD and does NOT need the extra sugar (bonus!) (I put two spoons of regular sugar and it’s veeeery sweet). 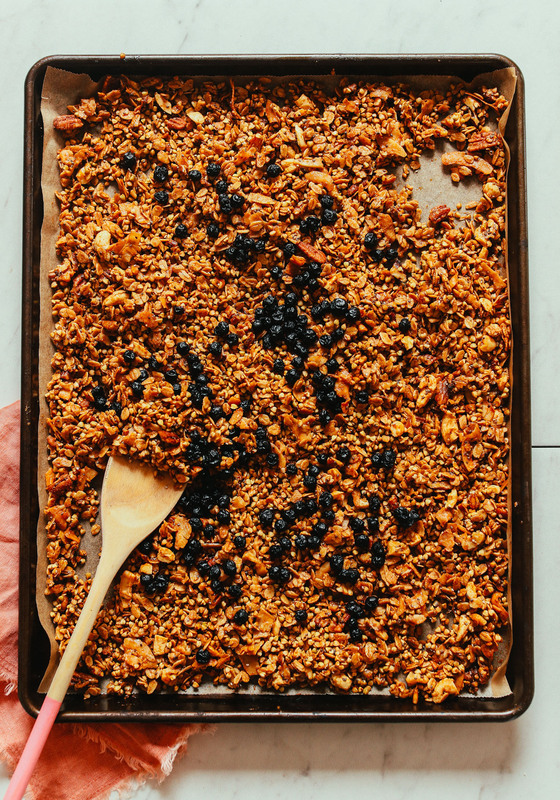 I baked mine for way longer than the recipe, though (kept tossing it around every 10 minutes and used my nose as a sensor for doneness) because I like my granola super crunchy! Thanks for posting; I love all things buckwheat! In the future I would love to see a baked good that uses buckwheat flour. Question about granola formulation: The best granola is clumpy and has plenty of binding. What components in the wet ingredients do this? Just the maple syrup? If so, why don’t more recipes use something stickier like brown rice syrup? You’ve got it! The maple syrup acts as a binder and in this case you should be able to use brown rice syrup instead, if preferred. Let us know if you give it a try! Best granola I’ve ever eaten, hands down. I swapped half the maple syrup for wildflower honey and used equal parts cashews, almonds and sunflower seeds for the nuts. It’s simply delicious. Every single bite has its own different depth of flavors; one bite is all a crunchy maple explosion, the next is softer with a hint of coconut, you eat a cashew, then taste the peanut butter and all that salty goodness, and then you get another sweet bite that goes hand-in-hand with the salty. I love this. Thanks for the recipe, and keep up the good work, because I adore this blog! I’ve been trying to think of different ways to incorporate more buckwheat into dishes and was so excited when I saw this recipe! First batch – delicious!!! Thank you! Also a huge fan of your dark chocolate sea salt granola recipe. Yay! Both are favorites of mine. Thanks for sharing! I recently made a similar recipe with kashi (roasted groats), and even though I love cooked buckwheat, the buckwheat totally ruined it. It was too hard to chew, felt like I was going to break a tooth. Would using raw buckwheat make a difference? Should it be soaked first? You can soak it but it’s not necessary and in my experience it’s not worth the time and effort. So, will using raw buckwheat yield a more chewable result than the roasted groats (Russian), even without soaking? OK, my batch is done. At first blush, it tastes heavy. All the buckwheat. I think I prefer a smaller ratio of buckwheat to oats. Another recipe I make uses 1/2 c buckwheat to 2 cups of oats. Works better for me. So lots of chewing ahead but on the positive side, lots of fibre for moving things along. I guess. Karen, thanks for the feedback. I also prefer quite a bit of oats in my granola. But buckwheat is a great option for those trying to lessen their grain intake (as buckwheat is a fruit seed – weird, I know). Hopefully switching up the ratio works better next time! I think she means raw. Toasted groats are another entity. Just making this now. Perfect timing for me too. I am learning how to make groats more appealing and tasty. I tried them once before – i think they were the raw/greenish color and the end result was tossed. bleck! I am now eating Bob’s Red Mill Groats hot cereal with chia and other spices and fruit and its ok. Do you have a brand of toasted groats you recommend? will try your granola! Well we don’t buy toasted, usually just raw. And the ones we bought were from Natural Grocers! I’ve been getting your wonderful recepies for a while now, and love them. I’m stricktly vegan, and gluten intolerant, and never use any processed foods. Just wanted to share with you that I learned to bake my own sourdough bread with nothing but buckwheat, qinoa, water and salt. I grind my flour shortly before I use it, just in a simple Vitamix, even not the special flour grinder. You must try this bread, it’s amazing. Thank you for your fabulous work. The photos are the addicting part. Yael, I would love your bread recipe! The video just shows buckwheat groats and they look roasted to me. I use raw groats for pancakes and they are not brown in color. Yael, that bread sounds amazing! Would also love to know more! Have it on my list to experiment with GF sourdough soon! Would love to have the actual recipe for sourdough bread. I have definitely missed it since going gluten-free. I imagine you ordered sourdough starter from somewhere as well? Thanks! The recipe calls for raw buckwheat groats (which are generally a greenish color), which could mean either uncooked or unroasted, but the picture looks like roasted buckwheat groats. Could you please clarify. Many thanks for your great recipes! I came to ask the same. Based on the picture, I’m assuming roasted! Nope! They’re definitely raw. The brand we bought was Natural Grocers. There may be color variation depending on brand. Huh, interesting! I’m going to see how it goes with my roasted ones…! Having said that… I’m worried these may be TOO crunchy. Maybe I’ll test a very small batch first. Hi. Is there a way to make this a raw recipe? It looks so delicious! I think millet and cocoa nibs would be another great addition. Can you recommend a process using these ingredients and a dehydrator? If not, do any similar raw recipes come to mind? There is nothing better than homemade granola!! This looks so yummy! DO IT. Let us know how it goes! Oh sounds amazing! Thinking of making a few batches to give to friends for Christmas, in pretty sealed jars! (Summer Christmas in Australia, I can imagine this with fresh mango cheeks and coconut milk!) Do hope it lasts longer than a few weeks though. You had the same idea as me! Summer Christmas in Australia is te best, it would also be delicious with fresh cherries! This looks great! When are you creating an app? I would pay at least $10 for a well functioning app with all your recipes! I’d pay $5 – $10 depending on features!